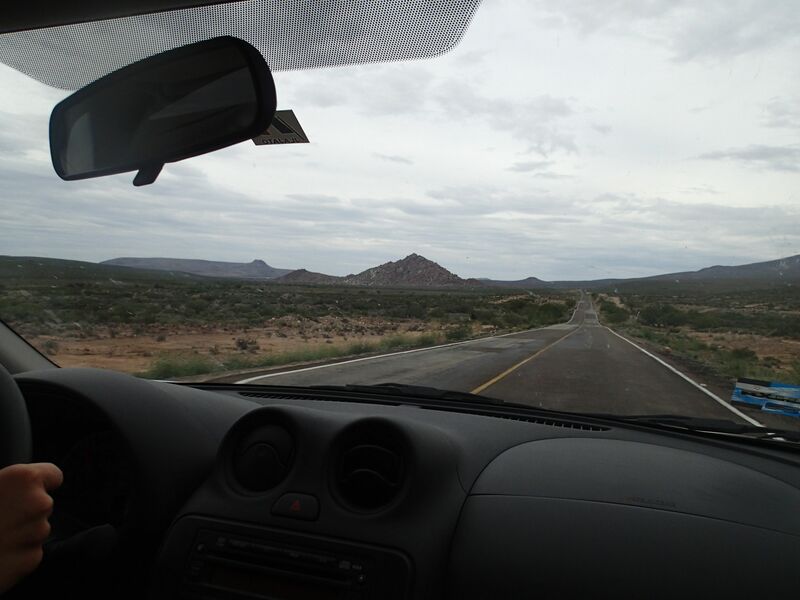 The summer brought some intense weather shifts, including some of the first rain we'd seen since our arrival in La Paz in February - I guess I should have been tipped off by the cactuses and tumbleweeds, but the amount of precipitation here still took me by surprise. Once the season shifted into high summer however, the heat of the day combined with the extremely warm water (sometimes it would be 38º outside and the water would be 23º, warmer than most swimming pools!) made for some crazy meteorological events. We were treated with regular lightning storms and sudden shifts in wind speed and direction, not to mention a couple of hurricanes that narrowly missed us. In this photo, a storm cell is crossing nearby to the south. At the time this photo was taken, the wind was blowing briskly towards the cell, but about five minutes afterwards the wind abruptly died and then within two minutes was blowing probably 40kn in the opposite direction! 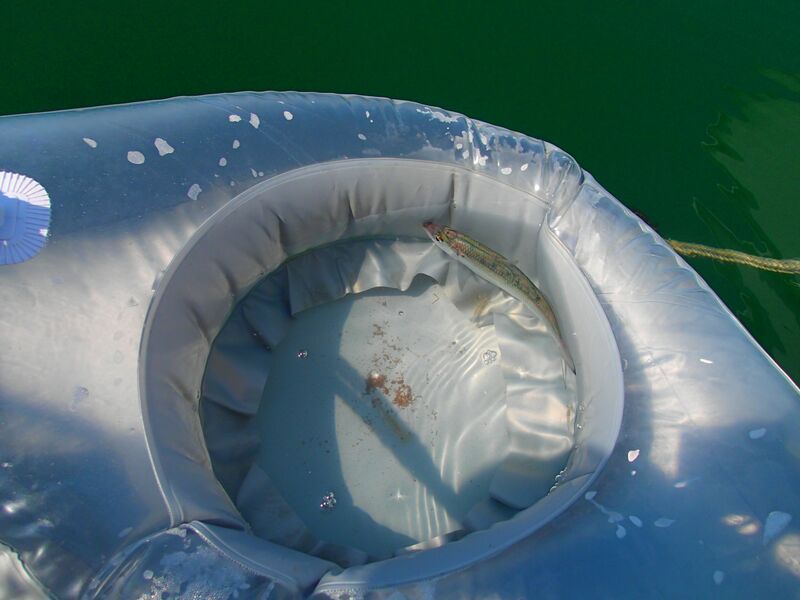 We were caught unprepared, and several items blew off the deck and I had to dash out in the RIB to retrieve them. *sigh*. pay attention to polarity, Drew. While I was in Canada, I ordered a low-power Fit-PC3 computer to build into the walls of the TIE Fighter. The Fit-PC3 is a 12v-native computer very light on power consumption - set up with an internal SSD drive, it draws only 6w (1/2 an amp) at idle. I paired it with a two-terabyte external drive that automatically spins itself down when not in use, and am quite happy with the results. Unforutnately, when I went to install the machine I didn't pay close enough attention to the polarity of the power supply, and hooked the power connection up backwards. 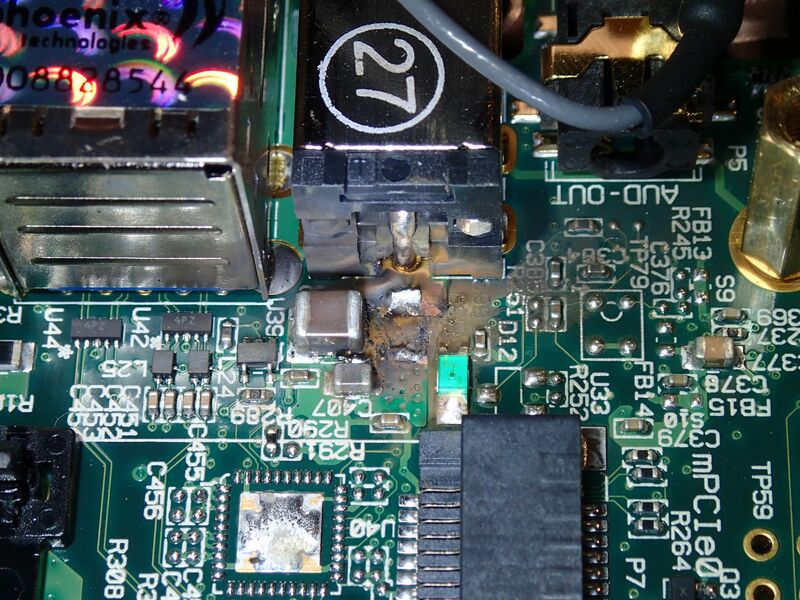 Immediately there was a flash and a pop and suddenly the air was filled with the acrid smell of burning electronics. Fortunately I'm no stranger to electronics repair, and with a bit of research and an email to the manufacturers of the Fit-PC3, I learned that the component that had exploded was a simple ferrite bead, meant solely to keep stray radio-frequency energy out of the computer. This bead is just a failsafe, sort of like a fuse, and I could just 'jump' over the section with a bit of wire for the time being. An hour or so with the soldering iron, and the computer lives. ...of course, that computer also now lives in a cupboard with a strong radio. I still need to track down a replacement ferrite, as I've seen three crashes so far when I've keyed up the mic on the ham radio on certain frequencies. a swarm of bees overtakes the TIE Fighter! One morning as we left the boat in the RIB to go for coffee, we realized we'd forgotten something at the main boat so we turned around. When we arrived at the TIE Fighter, we found the boat swarming with bees! 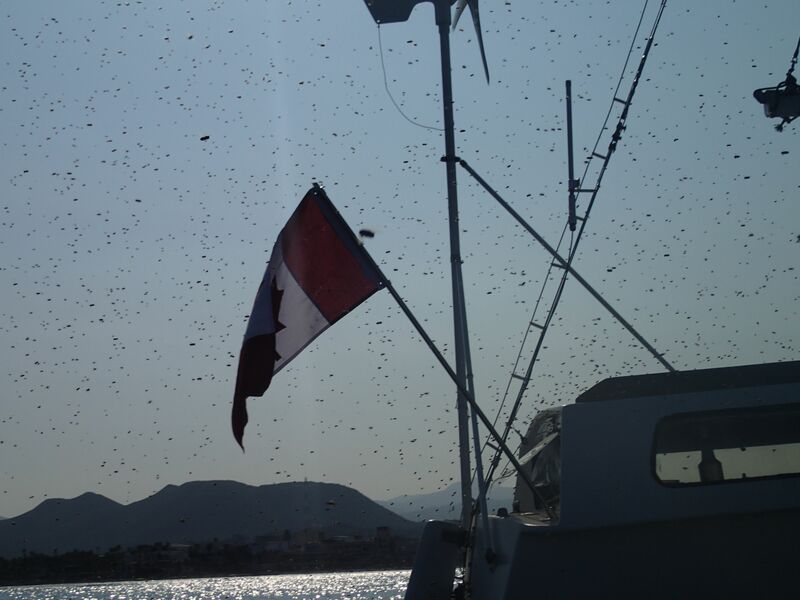 We estimated around 10,000 honeybees in the air around the boat. 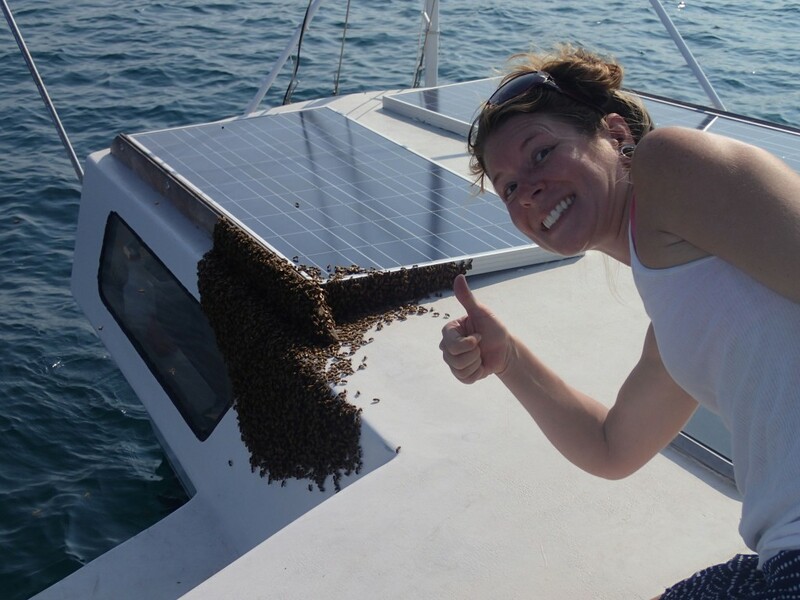 Not knowing what to do, we went for coffee and solicited opinions from a few other cruisers, who brought to light one very important point that we somehow hadn't thought of... if the bees were to get inside the boat, they might not want to leave! 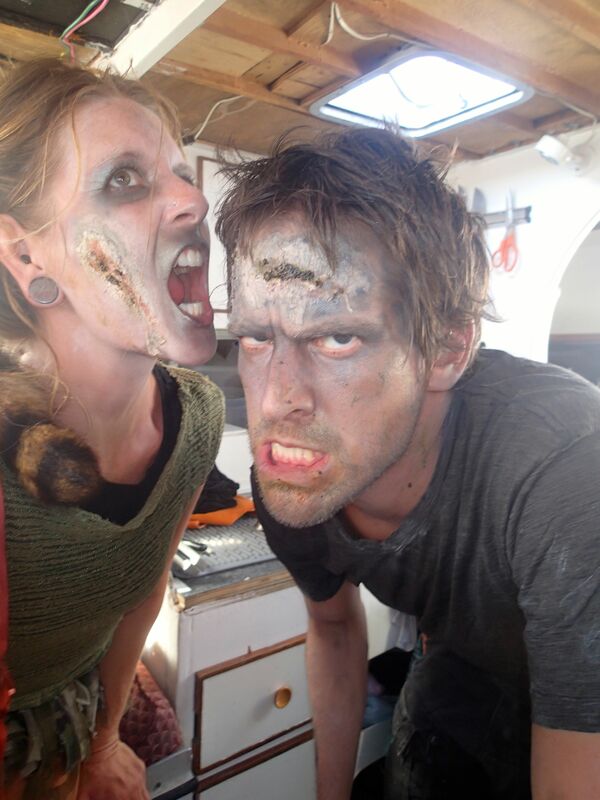 We had to return to the boat immediately to close up the doors and windows, hoping that they hadn't already moved in. When we arrived back at the boat, the bees had landed... but outside. The internet tells us that this means the queen bee is somewhere in the middle of the literal pile of bees on the boat. We figure they were stacked six or seven deep in this photo! Fortunately, they decided that the boat wouldn't make a great spot for a new hive, and within an hour or two of this photo they'd all moved on. While I went back to my day job schedule, Miya undertook the massive task of painting the TIE Fighter's decks with anti-skid paint. We had collected a large pail full of white sand from a nearby beach, and then sifted and washed it, allowing it to dry overnight in the boatyard on a clean sheet of plywood. In the end though we decided that we'd get a better-looking result from "marmolina"; fine crushed white marble available at the local fereterias for about $0.50/kg. 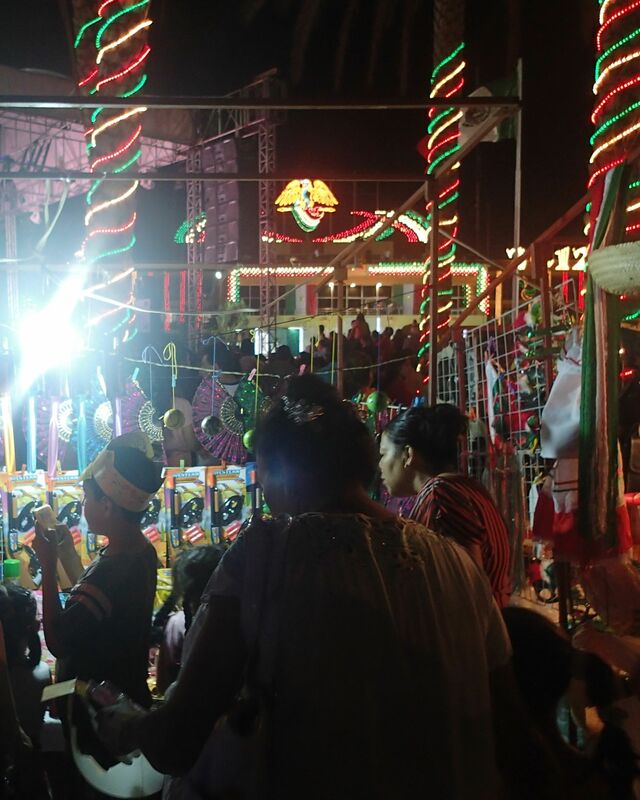 The celebration of 16 de Septiembre (Mexico's Independance Day) came along, and rather than hole up in our little box on the ocean, Miya and I decided to brave the crowds and go see the fireworks display. The display lacked a certain... safety standard? that we had grown accustomed to in North America - the main celebration was in a town square flanked on three sides with two-story buildings, and the fireworks were launched from the roofs of those buildings, exploding directly over the square! Our Honda EU2000i generator has given us incredibly reliable service for the past four years or so, but apparently one should not leave it for a Mexican summer with a third of a tank of gasoline... when I went to start it up for the first time in many months, it would not start. 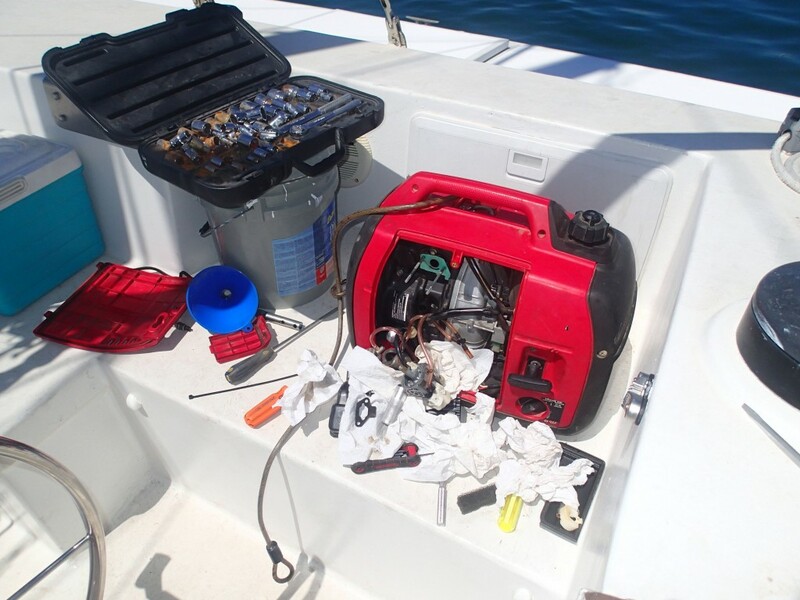 I quickly realized what the problem must be, and using this very well-written step-by-step howto, I tore the generator apart and cleaned the carburetor. Just like that, the little Honda purred back to life. The heat of the summer was intense and constant, and often we had to spend the hottest portions of the day in the water just to maintain our sanity! The underside of the TIE Fighter made for a convenient gathering space, and using a series of ropes and floating toys and platforms we created a place of refuge from the afternoon sun. Crazy how you can see them avoiding the anchor line! We'd like to identify the species of fish, and then see about catching some for grilling or pickling. Miya found an inflatable toy at one of the swap meets; three inflatable bladders joined at the center by a square of mesh, forming a floating recliner. This, paired with a Canadian Tire 'Party Platform' that we picked up on clearance just before leaving Canada in September 2011, formed the seating portion of the underwing. You can also see my Traynor TVM-10 cordless rechargeable guitar amplifier in the nets above, hooked up to an iPhone and playing appropriately chilled house music down into the watery tunnel. Of course, with freshly-added antiskid on the topsides, the boat herself - having a good meter of freeboard - made an excellent water toy. Miya had only really learned to swim in the last year or so, but managed to learn to dive in one day! She was so impressed with her diving that she decided to try her first-ever backflip off the boat also... to a little less success. One of my absolute favourite parts about the cruising lifestyle is the willingness of the participants to pick up new musical instruments and throw themselves into learning. 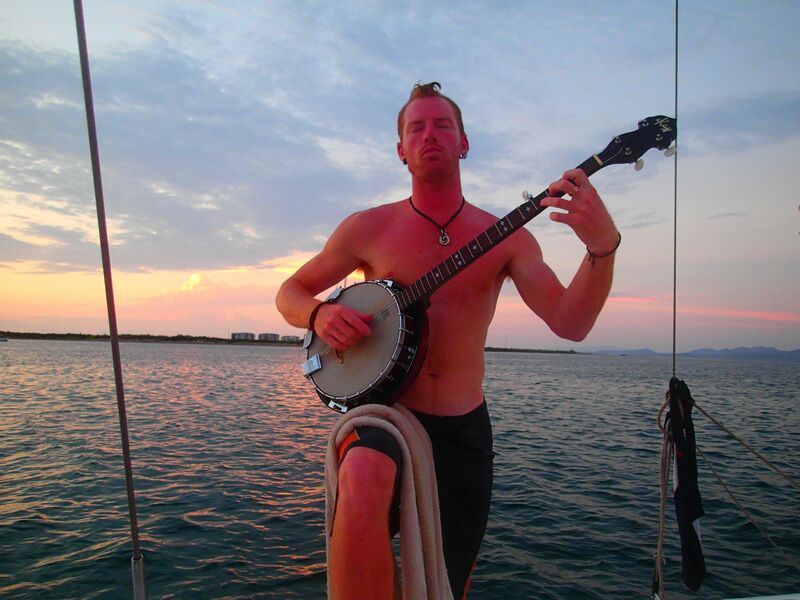 Our friend and neighbor Malcolm, an Australian vagabond living on 'Wind Pirate', picked up a banjo in a trade with another boater and within days was plucking away. 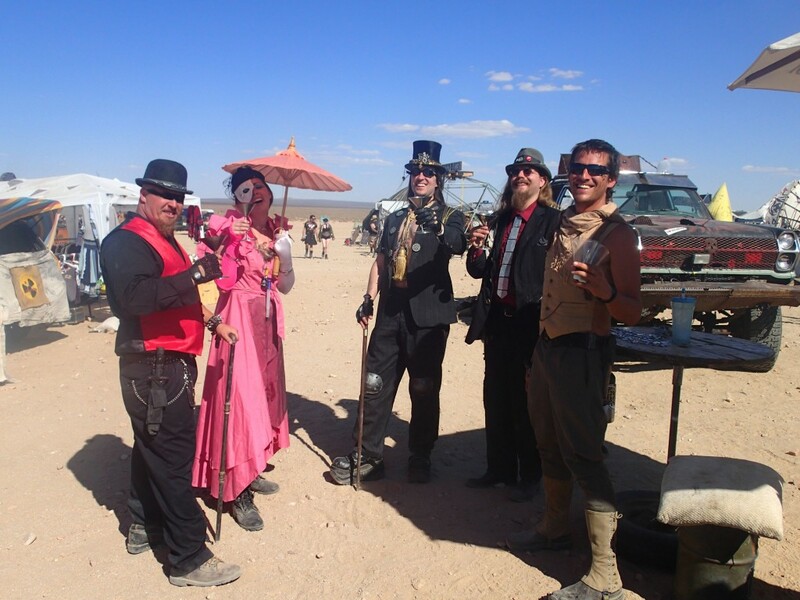 When we heard about the Wasteland Weekend festival in California, the idea immediately spoke to both of us - a four-day party in the desert, sort of like Burning Man but more Mad Max themed, if that even sounds possible. 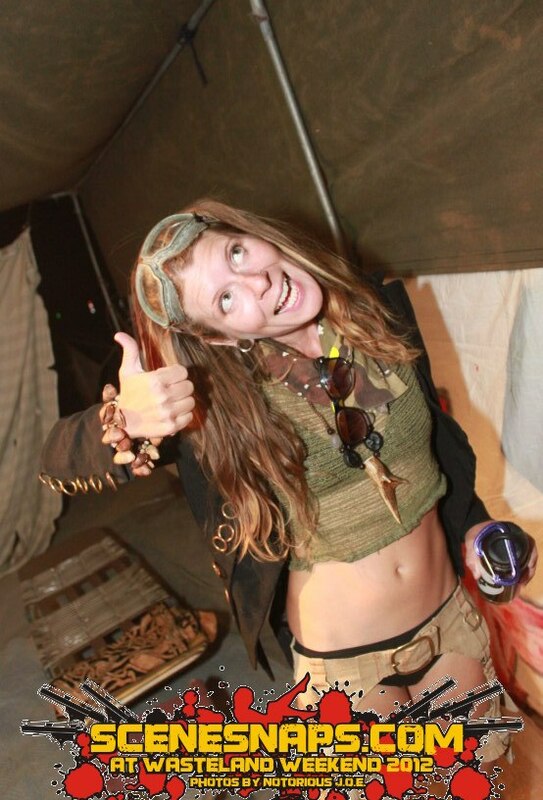 With our Wilderness First Responder first aid certifications, we figured if they were interested in having us on as volunteer medics we'd kill a few birds with one stone; go on a road trip, pick up some much-needed supplies from the states, get some practical medical experience and go to a rad party! We rented a car and prepared to head out... but of course, what with it being hurricane season, a tropical storm had formed south of the peninsula and was threatening La Paz. 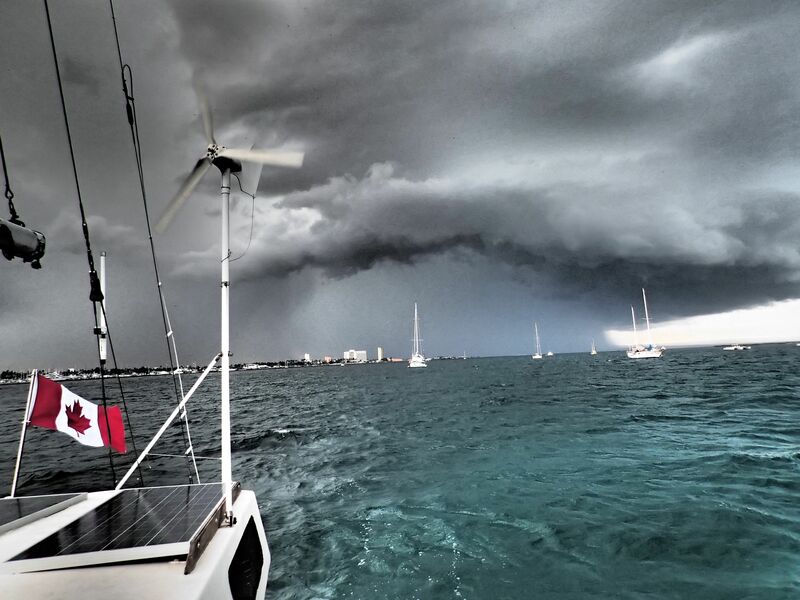 We couldn't leave the boat unattended until we were sure that it wouldn't turn into a hurricane. Fortunately, the system weakened, but not before dumping rain on southern Baja - and if you haven't seen what a major rainstorm does to a desert, it's a crazy thing indeed! In this video, we have been stopped by a washout - the road in front of us has been replaced by a river of brown water flowing at a pretty fast clip. We watched as a compact car was swept a few feet sideways - but in the true spirit of "drive 'er like a rental", we decided to take the risk and we crossed. If you watch closely you can see water come up over the hood of the car at one point! We arrived late to Wasteland Weekend but wasted no time whatsoever getting into the groove of things. Having come internationally we had no weapons to defend ourselves from the mutant / zombie uprising, and so we decided that we were clearly 'wasteland aristocracy' and as such had no reason to carry large weaponry of our own. With this thought in mind it wasn't long before we ran into some kindred spirits, fellow patricians of the aftermath, with whom we shared libations and cheer. The Party Hard Corps crew are a fascinating group of partiers, gamers and drinkers from the midwest, who like us traveled to the desert for a few days of debauchery. There were many (semi-)organized events, including robot battles and jugger matches, but the one event I was most looking forward to taking part in was the archery competition. The rules were fairly simple - scoring was based on points awarded for your five arrows to a mannequin about thirty paces down a range. I was relieved to find they had bows available for loan, as I hadn't owned my own bow in many years. 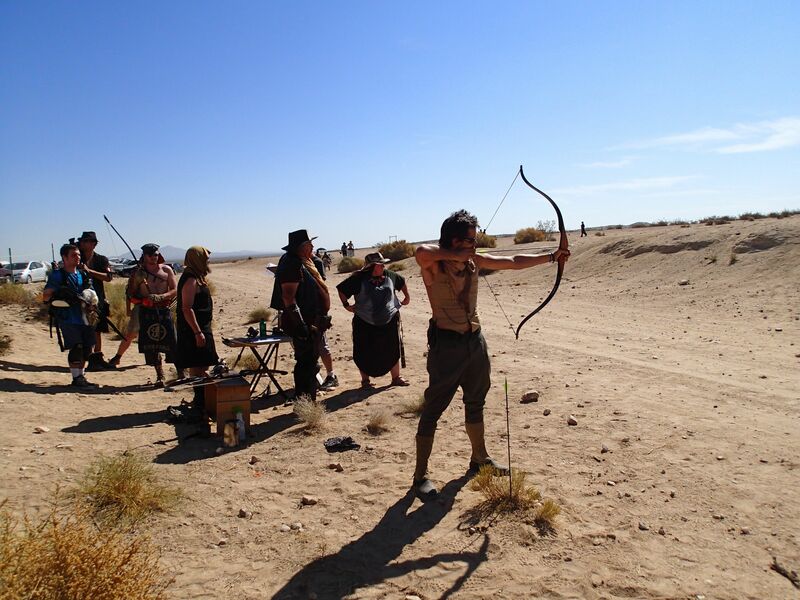 There were three divisions, for different sorts of bows: recurve, compound and crossbow. I can say proudly that out of about forty or so competitors, not only did I win the recurve division, but I also had the highest score over all three divisions - 28 out of a possible 30. The prize was a little disappointing however; a large black t-shirt. Not my size and I refuse to wear cotton t-shirts. In retrospect I should have taken the shirt and re-gifted it to one of the Party Hard Corps guys or something. Our medical shift was Saturday night from 10pm until 4am - arguably the worst possible shift if your goal is solely to party, but we got enough of that in during the previous night and the Saturday afternoon, and as both the new jacks on the scene and late to the party to boot, we were happy to help out and glad to feel useful. We were surprised at how few emergencies there were, to be honest - the partygoers seemed to self-regulate very well, and aside from a few scalds from fire-show screwups and a few cuts and scrapes, we weren't actually very busy! There was always something going on, but we never felt overwhelmed. 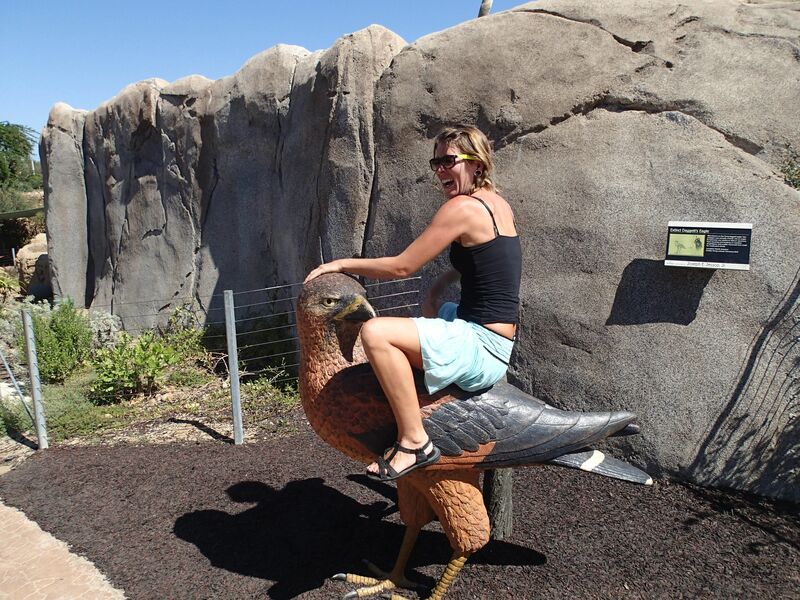 Miya at the San Diego Zoo, riding an eagle. After a long but uneventful drive back down the Baja Peninsula, we settled back into our routine by immediately having people over for another party. In this photo, Scott is demonstrating his ability to do a full split! That's it; serve with ice cubes if you have them. Do not blend. Do not rim with salt. Do not use lime bar mix or Fresca. Do not add simple syrup. Mix and enjoy! Whoops - we left the party platform deployed under the boat while we were in the states! When we pulled it up, the side-pockets were full of life. If you click on this photo, you can clearly see the large fish at the top, and several big, transparent, shrimp-like invertebrates swimming around in the captive pool. There's a really sad story here - but before it was sad, it was a very happy story. 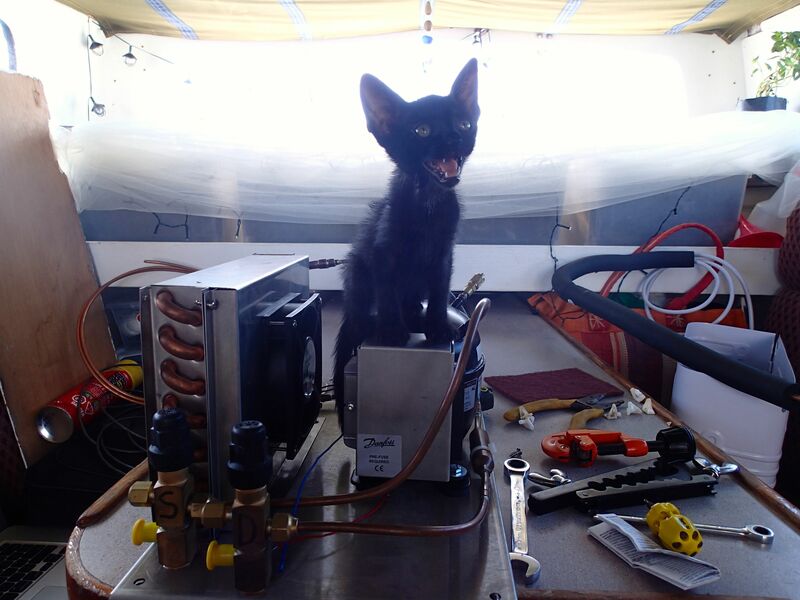 We adopted a scraggly little Mexican street kitten and added her to our boat-gypsy family. I'll tell the story of little 'Alice' in another blog post. It turns out that the 'Zombie Walk' phenomenon is wider-spread than we'd previously thought, and La Paz actually played host to an entire horror-themed film festival entitled 'Morbido La Paz'. There are few things that Miya and I like better than an excuse to get dressed up and silly, so we put together the best zombie costumes we could with our limited boat resources and shambled out into the town. One of the things we brought back to La Paz from San Diego was a long-coveted item - an icebox conversion kit which would turn our little built-in icebox into a proper refrigerator, complete with freezer! The kit cost an arm and a leg, and came as a box of parts and a series of cryptic instructions, including a bunch of crazy tool requirements. I had to track down someone in the boating community who would be willing to loan me an industrial vacuum pump and a set of refrigerator manifold gauges. 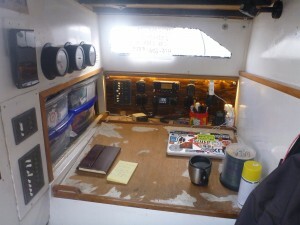 As it turned out, none of the tools were far away and even though the build took much longer than expected, our friend Bill on s/v Wandering Puffin was a huge help in getting the system up and running. Now, for the first time since moving aboard in 2009, we have the ability to store food for longer than a couple of days at a time! What a huge step forward... though admittedly so far my favourite use of the fridge is making ice cubes. Sill though - just because nothing in our world can ever be completely normal - the fact that our fridge is a top-loading icebox means that we're forced to use an expensive vertical ice cube tray. One of the sad facts of cruising life is the realization that no matter how much you like your new friends, everyone is traveling, and sooner or later we all have to pull up the anchor and move on. 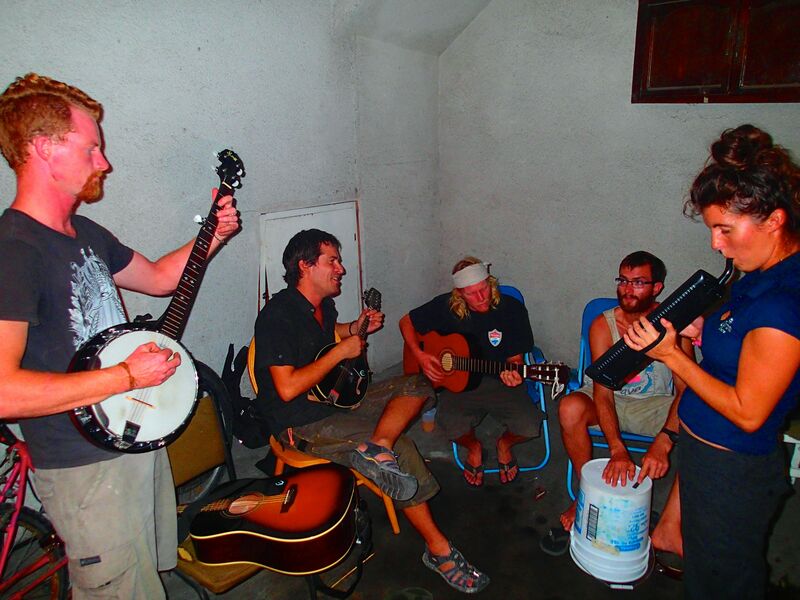 This photo is of some of our friends from the summer; Malcolm and Lowell left on s/v Libertatia for California, arriving recently in San Francisco, and Mike and Nia left La Paz for Mazatlan in their boat s/v Azul, making it across the Sea of Cortez without incident... and without an engine! Well, I think that pretty much brings us back up to current. More updates to come soon! "TIE Fighter, TIE Fighter, Estrallita." "Estrallita, TIE Fighter, go two-one, over?" I have to say, one of the things I've been enjoying most about La Paz is the active community of sailors monitoring and communicating on their VHF radios. 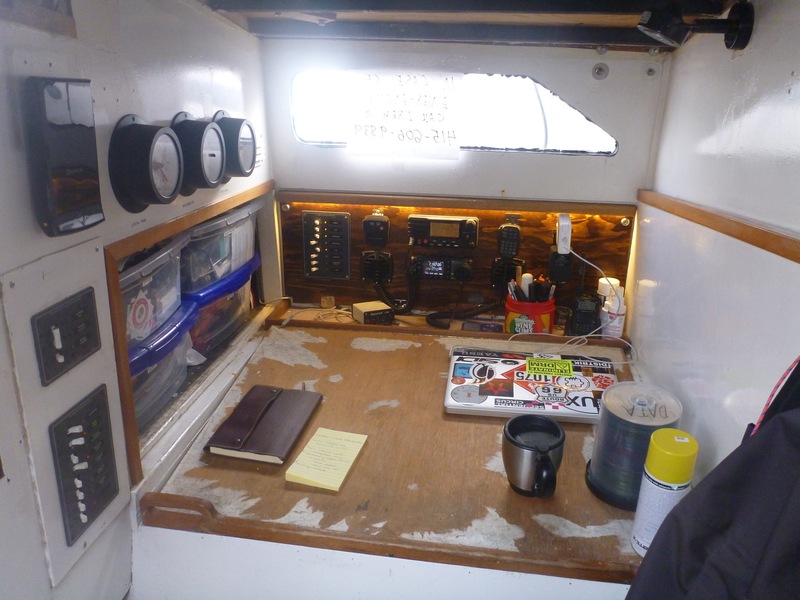 Most of the boats have their radios on listening to channel 22 full time, and there is a popular radio net every morning, giving updates on weather, tides, lost and found, boat arrivals and departures, local news, swaps and trades and more. Seeing how effectively it creates a bond among the sailors in the harbour, I think if I were back in Vancouver I would try to encourage a local False Creek radio net. The great thing about VHF is that the hardware is cheap and easy to use - the downside is that the functional range of the VHF signal is somewhat low. The signal can go a lot further, from land-based transmitters or larger installations, but for a ship at sea you get about ten kilometres and that's it. That's where higher-power radios come in; on the TIE Fighter I've recently (finally!) finished a long, expensive ham radio install. 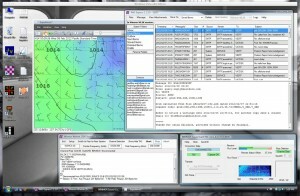 Since then I've linked the radio with my laptop, and have been able to use it to send and receive emails from sea and update our current position with the WinLink.org tracking site. Through the emails I've also been able to have weather reports and even up-to-the-minute satellite images sent to me, giving us a view of what's happening over the horizon and letting us know what to expect during those stressful nights at sea when the winds just won't stop building. It's not like data over ham radio is a new concept, though admittedly the number of active hams has been somewhat in decline for the past twenty years and the interest in packet radio doubly so. Ham radio in general has been picking up a little lately, probably in part due to more and more people taking interest in emergency preparedness and doomsday scenarios - nobody really seems to have a land-line telephone anymore, and if there's a big earthquake or natural disaster of some type, history shows us that the cellphone networks cannot be relied upon. Still, the concept of linking ham radio with the internet has fallen somewhat, due to cheap, fast and ubiquitous internet access. I have not been able as of yet to get a straight TCP/IP connection to the internet over the radio; I've only been able to send and receive messages. For what it's worth, ham radio is apparently in my blood! 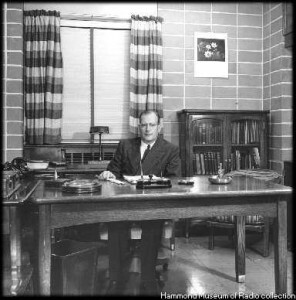 Two of my uncles are active hams, and my grandfather on my mother's side was the Chief Engineer of CBC Radio for many years. "Marconi" Moe Smith was responsible for the design and construction of the huge Radio Canada International 500,000-watt curtain array antenna, broadcasting CBC radio international - to most of the planet - from Sackville, New Brunswick. It took me thirty years to finally take the plunge and get my ham license, but when I took a certification class with the Bluewater Cruising Association I found myself slapping my forehead in disbelief at the parallels. I have been a certified pocket-protector computer nerd since a very young age, dabbled in homebrew electronics and spent countless hours in front of a bank of analogue synthesizers, all of which contributed to me receiving an honours grade on my ham radio exam. For the ham radio install, I chose an Icom IC-7000 radio - I considered the Icom IC-706, but I figured if I'm only going to buy the one radio, I should buy one with ample room to grow and features geared towards using the radio specifically for data. In retrospect I'm not sure I gained much going with the newer model, but I'm not dissatisfied with my decision. For a tuner, I was recommended the SGC-230 Smartuner over the matched Icom AT-180, because the SGC-230 can be used with any radio, not just the Icom, and I figured that might come in handy someday if I upgrade (or otherwise destroy) my IC-7000. On other recommendations, I also added a marine voltage booster and a tuner interface device to make the radio and tuner work together even smoother. 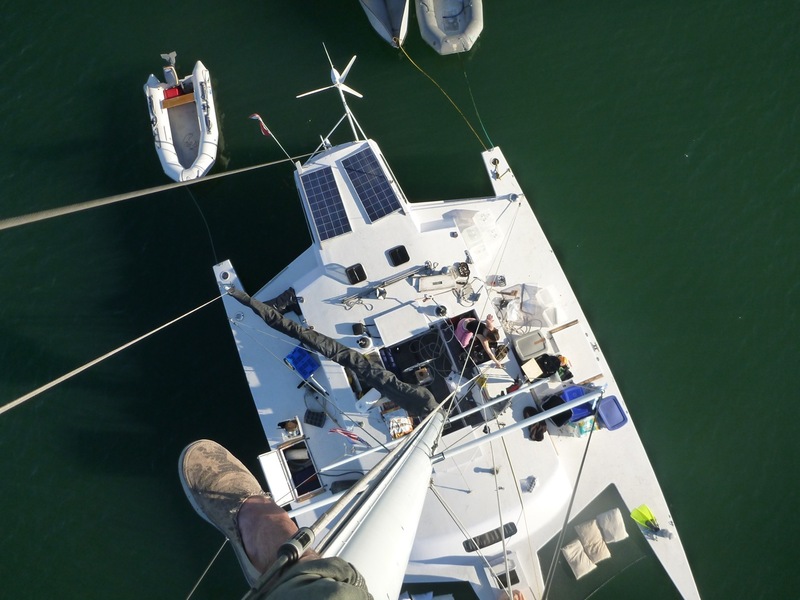 For the antenna itself, I had a secondary, non-structural backstay constructed by Ed at Sailing Supply in San Diego. The 3/16" stainless backstay is somewhat overkill, given that it will never see any serious loads, but at least it's nice to know that it's there in case my main backstay ever breaks, and I don't have to worry about my main backstay losing strength from being cut to add the insulators. Lastly, I had to add a radio-frequency ground - this is similar to an electrical ground, but for radio-frequency energy. Normally on a sailboat you would connect the RF ground to a series of copper straps that are eventually bound to the huge chunk of metal in the keel, but with TIE Fighter not having a keel I had a bit of a problem on my hands. I would have to add a lot of copper strapping, creating a counterpoise of a few hundred square feet - and with the price of copper currently through the roof, I wasn't looking forward to dropping hundreds of dollars on copper alone. I had a recommendation of a new kind of counterpoise, a "KISS-SSB" - apparently a thick rubber hose with over 600 feet of carefully-sized wires inside. It was about a hundred bucks, so I figured I would gamble and give it a shot before forking over for the copper ground. It worked, though I'm not entirely satisfied with the results... I think the real goal of the KISS-SSB is to provide a counterpoise very specific to the small number of frequencies used for Marine-SSB, not the enormous spectrum available to ham radio. I've been experiencing a lot of RF feedback in the signal and in the other electronics on the TIE Fighter - everything I read says that this is because my antenna tuner is not properly grounded. RF grounding for marine radio, as it turns out, is a huge can of worms with many fiercely-defended opinions. I've got a few lines out to experts, and I think the next step will be to try replacing the KISS ground with a thick copper wire going to the bolts holding my propellor-shaft strut to the bottom of the boat - it's one of the very few metal items that make contact with seawater. If the information in this PDF is accurate, I should be able to get away with it - otherwise, I might have to drop the money for copper strapping. Once all of the parts were installed (including a new VHF radio, a Standard Horizon Matrix AIS+ hurriedly purchased in Sausalito when our previous VHF quietly died the day we were leaving for San Diego) in a newly stained, varnished wood panel, we left offshore for two weeks, giving me a lot of time to spend bent awkwardly over the nav table fiddling with the radio dials. Within a couple of days I had figured out enough to get into Winlink and start sending and receiving emails, which made the trip down feel immensely less isolated. I don't think I've welcomed email from friends and family as much as I did on that trip since my first internet emails almost twenty years ago. The grand overall cost of the radio equipment and installation was somewhere around $3,000. I was careful to select components that are modular enough that I could migrate the system to another boat or to a land-based station in the future, and I feel like I've succeeded in making the setup somewhat "future-proof". Admittedly I could have spent a third of that on a satellite phone and had $2000 leftover to spend on a data plan, but I don't feel like a satellite phone would give me the same sense of being a part of a global community as the ham radio has. Arguably our most important guiding tenet on this boating adventure is to actively strive to be as self-sustained as possible. It would be difficult to call ourselves self-sustained while paying a monthly phone bill to a satellite service! Now that the ham radio is installed, the bills have been paid and the licenses acquired, we're free to use it for the rest of our lives without any further fees - communicating from virtually anywhere in the world, using power that we generated from the wind and the sun. That's a good feeling.